Powers/Abilities: Kort has no superhuman physical powers nor does he have any particular scientific genius. He is a wealthy and powerful man, the CEO of a scientific research firm--Visionary Productions. He believes his money and power enable and entitle everything, and he is willing to manipulate or sacrifice anyone or anything to get what he needs/wants. He employs a number of Ultras as agents, and he is also served by the Cybernoids. History: Some variation on the normal jumpstarts caused certain individuals on Earth to develop the Theta virus. The virus did not appear to actually be contagious (at least it was not shown to be), but rather than just cause people to become Ultras, it also would rapidly progress to death. Kort sought to utilize and manipulate the victims of the Theta virus to become his agents. He also wished to learn how to synthesize the virus and control the process to form an army of agents. While the efforts of his scientist, Deeters, had met with limited success, he continued to send his agents to capture anyone identified with the virus. In this he was opposed by the Exiles, who were seeking to bring the victims to Dr. Rachel Deming, who wished to cure them and teach them how to use their powers. (Exiles#1-4) - Kort sent the Supreme Soviet and his Cybernoids to capture Amber Hunt. When the Soviet was foiled by the Exiles, who took Amber to Deming, Kort had him used as a test subject for Deeters, which was mostly a success--although the Soviet died in the process. Kort then sent agents Bruut and Bloodbath to obtain another victim, Timothy Halloran, which they did successfully, despite the efforts of the Exiles. Halloran's possessed a much higher level of Theta Virus activity than previous subjects had, and when Deeters initiated the process, Halloran's energies reacted violently and exploded. Deeters and Kort both survived the explosion, but Halloran escaped. Kort sent Bloodbath to recover Halloran, and he sent his other agents to capture/subdue/slay the Exiles, who were attempting to rescue Halloran. Events escalated between the Exiles and Kort's agents and ultimately Ghoul blew up Deeters' generator, causing an explosion which destroyed Visionary Productions, and killed Kort, Deeters, and everyone else in the building. Ghoul, being somewhat dead to start with, was the only one to recover. 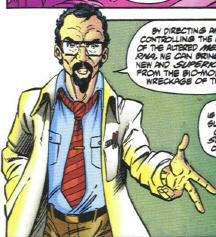 In general, no one in the Ultraverse has any connection to anyone from Earth-616 or any other reality, unless specifically stated. Presumably creations of Deeters, Kort, or another of his employees, these were robots programmed to serve Kort and assist his agents. Several of them were sent with Supreme Soviet in the failed mission to capture Amber Hunt, but they were relatively easily destroyed by the Exiles. Another Cybernoid was tracking Timothy Halloran after he had escaped the Exiles. However, as it was tracking Halloran for Kort, it may have either dysfunctioned after the destruction of Visionary Productions and its central computers, or it may have abandoned its programming when its goal was no longer possible or relevant. 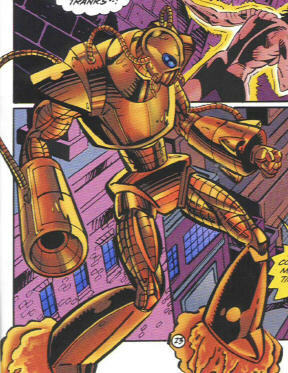 They possess programming and data files which enable them to assess and react to the strengths and weaknesses of their foes (similar to the Sentinels), but they are relatively slow moving and far from indestructible. They can fly, project energy blasts, and track the energy signature of others. They may well have been tied directly into some remote computer in Visionary Productions. Deeters was Kort's chief scientist studying and working on replicating and controlling the Theta Virus. He was killed in the explosion of Visionary Productions. Deeters was presumably an expert in the field of biochemistry. This was Kort's research firm, dedicated almost exclusively to work on the Theta Virus to build an army of Ultras for Kort. It served as a front for his illicit operations, posing as a legitimate research firm, and possibly in the field of entertainment as well. It was destroyed when Ghoul blew up Deeters' generator, which also killed its CEO and many of its employees.